Democrats escape the heat in Geneva with a little after work refreshment at Brasserie des Halles de l'Ile Thursday night. There was much talk about health care, the hopeful signs in the economy, and of course the UBS banking case. 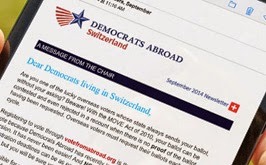 A reminder invitation will be sent out to Democrats Abroad Switzerland members for the September after work meet up - hope to see you all there!